Clinton managed to calm and console embarrassed foreign leaders after the Wikileaks revelations, build a coalition that helped topple Libya’s Muammar Qaddafi, and maintain the isolation of Iran; whether you agree with U.S. foreign policy or not, her skill has been on display as she’s set the secretary-of-state all-time record for most countries visited (100, in Latvia, late last month). And people have noticed: By a two-to-one margin, people approve of her performance. 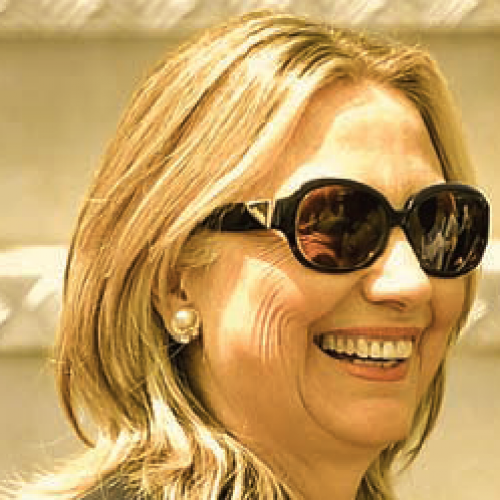 Though she disparages the talk, there’s a serious Hillary 2016 boomlet underway. “Why wouldn’t she run?” asked Nancy Pelosi last month. “She’s a magnificent secretary of state.” She’s even cool: The “Texts from Hillary” Tumblr, in its week of existence, was shared 83,000 times on Facebook.There is, however, one looming gap in her record. And it’s in an area that will likely help determine both her legacy and her future prospects, at least if scientists are correct about the scale of the coming crisis. As a climate change diplomat, she’s got little to show for her efforts. On what may be the biggest, hardest international issue ever, she has more or less punted. THE FIRST SIGN that things weren’t going quite according to plan came in the fall of 2009, in the run-up to the giant Copenhagen meeting on climate change. This was supposed to be the big moment when world leaders came together and—after two weeks of religious processions, giant concerts, and touching speeches by small children—set firm targets for reducing emissions. But as the conference date approached, it became clear that no real agreement would be forthcoming. In the broadest terms, much of the world wanted the United States to agree to deep emissions cuts; the United States was demanding more accountability from the Chinese and other developing nations about how much carbon they were spewing. Clinton arrived midway through the conference to, in the words of Politico, “throw a climate change Hail Mary” with a speech promising $100 billion per year to “address the climate change needs of developing countries. The offer was supposed to galvanize the talks by pressuring the Chinese into more transparency about their own emissions. But the offer was pretty flimsy. Clinton wouldn’t say how much of the money the United States would provide—indeed, she said it would come from a mix of private, public, and mysterious “alternative” sources of cash. President Obama arrived a day later and, in chaotic late-night negotiations with other world leaders, knocked out a three-page “Copenhagen Accord” designed to save face, if not the climate. But it barely managed even that. Everyone quickly figured out it was voluntary, with neither a timetable nor an enforcement mechanism. One European newspaper op-ed likened it to the surrender at Munich. Greenpeace called the conference a “crime scene.” Subsequent summits in Cancun, Durban, and, most recently, Rio were equally disappointing, with progress toward hard targets for emissions no more forthcoming. Clinton cited as Rio’s main accomplishment: “new thinking that can lead to models for future action. It should be said of Rio that people left here thinking, as the late Steve Jobs put it, not just big, but different.” The statement was an implicit acknowledgement of the ongoing stalemate: Unlike Clinton and the other world leaders, Jobs actually produced things. And many environmentalists have since blamed the administration for failing to advocate for their goals more strongly. “From Copenhagen on, the tactics they’ve employed—well, if it had been the Bush administration, they would have been globally derided for putting the world on a path towards climate chaos,” says Erich Pica, head of Friends of the Earth. Still, Clinton doesn’t really deserve most of the blame for the failure of the negotiations, because given Republican unwillingness to even acknowledge climate change, she had very little with which to negotiate. Clinton’s negotiating partners could see that the Senate was unlikely to approve any treaty she concocted. (It takes a two-thirds vote to approve a treaty, making it even harder to overcome than the filibuster.) Even more basic things—like rounding up a little of that annual $100 billion—depended on convincing a Congress dominated by the energy industry. It would have taken more than a diplomatic superstar to carry the day: It would have taken a fully engaged president willing to spend considerable political capital and an American public focused on something other than trying to find the bottom of the Bush recession. No, for Clinton, the only fair test of her climate convictions came later, and by accident. Under an oBscure regulation that usually applies to such projects as bridges connecting Maine and New Brunswick, infrastructure that spans national borders requires approval from the Obama administration. So when the TransCanada Corporation applied to run the Keystone XL pipeline from the tar sands of Canada down to refineries in the Gulf of Mexico, the State Department became the lead agency in determining whether the project was in the national interest. That’s when the soap opera started. I didn’t find out about it until much later—it was only last summer that I became involved, after NASA climatologist James Hansen pointed out that the tar sands are the second-biggest pool of carbon on the planet and that, if we burn it on top of all the other fuel we’re busily combusting, it would be “game over.” Because of that, I went to jail last August with 1,252 others outside the White House, as part of a large-scale civil disobedience action. But once we were out of Central Cell Block in Washington, and once it had turned into a cause célèbre, enterprising reporters and advocates began looking into the way that Clinton’s State Department had handled the application. What they found was bizarre. Orlando declined to comment for Hersh’s article and at some point was posted overseas to Nigeria. By then, the project was in a state of “internal chaos”—at least, that was the description one Ottawa embassy staffer used when she was e-mailing a friend (who happened to be a lobbyist for Trans-Canada). The mess got so bad that several senators demanded an investigation. Eventually State’s in-house inspector general ruled that there were no technical violations of the law, but that the State Department’s “limited technical resources expertise and experience” for evaluating the project’s environmental impact hampered the review. “Given the pledge that President Obama made to get rid of lobbyists and their influence, we were surprised at the amount of access and influence a few key representatives of TransCanada clearly had to the inner workings of the process,” says Pica. In one sense, then, President Obama did Clinton a favor—by short-circuiting the review process early in the winter and announcing that TransCanada would have to reapply for a new permit. That temporarily ended what had become the most public environmental battle of the president’s first term, postponed the eventual decision until after the election, and gave the State Department a chance for a do-over. But the available signs suggest that Foggy Bottom hasn’t changed its ways. Not only are the same higher-ups still running the pipeline project, but the proposed scope of their next review, as outlined last month, doesn’t even list global warming as one of the issues to be considered. IN RECENT MONTHS, Secretary Clinton has taken to promoting an initiative to build better cookstoves in the developing world. If carried out on a massive scale, the project would help with climate change: The black soot that primitive stoves produce as they burn wood or dung accumulates on ice, speeding its melt. It would also help women and children, two million of whom may die each year from inhaling the fumes from their fires. But there have been many cookstove initiatives over the years, most of them failures. So far, this one boasts funding of just $105 million, or about .1 percent of the money she promised at Copenhagen. Doubtless it will do some real good in particular places, and doubtless it won’t actually slow climate change very much. That task would require standing up to the fossil fuel industry, starting with a serious and thorough review of the climate impacts of the Keystone XL pipeline. “I bet NASA would lend Jim Hansen to State to help,” says Pica. “Since Clinton has said she’s not going to stick around for a second term, she needs to think about the legacy she wants to leave behind. It would be incomplete if she didn’t address climate change. Given the new Keystone review, there’s still time for her to grapple with it seriously. But not much. Bill McKibben is founder of 350.org, which helped organize the fight against the Keystone XL pipeline. His most recent book is Eaarth: Making a Life on a Tough New Planet.This article appeared in the August 2, 2012 version of the magazine.